I'd be willing to bet that Michigan State, Stanford and USC have lines equivalent in star power to that of the Irish. In terms of actual and expected production, they're all far ahead of ND's line. As for the rest of the schedule, I don't expect Army, Navy or Syracuse to contend with the Irish in terms of star power because they're not national powers. 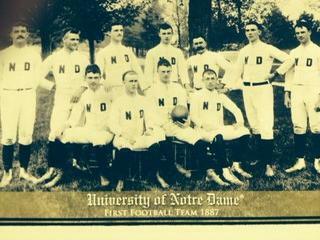 But even if ND gets through their schedule 12-0, what's the ultimate goal? If it's winning a national title, they still have to meet up with a team like Ohio State or Alabama that has actual big boys who can give Malik or Kizer a long day. USC with Green and Gustin are probably more talented but MSU is probably three stars plus McDowell and Stanford is probably three stars plus Thomas. I have no idea but I'm sure it's close. I don't disagree with you regarding what it takes to win - building from the inside out. I just think it's going to be real hard for ND to land big time edge rushers. I hope Notre Dame figures out a way to translate their OL recruiting and production into actual production in the big game, because they rushed for 121 yards and gave up four sacks to a backup OSU defensive line that was missing its two best linemen. Imagine if Bosa and Adolphus Washington played that entire game. Disagree here. We fell behind 2 scores early and had to play catch-up the whole game. Adams averaged more yards per carry than Zeke did...the only difference is that Zeke had twice as many carries. Our O-line played fine in that game I thought. Had the defense been able to get a stop we may have been able to run it with a normal game plan a bit more. And don't forget that while OSU's two best defensive lineman were out...so were ours. Day played very little due to his foot (and was ineffective when he did play) and Jarron obviously played very little and wasn't close to fully recovered. And to top it off...their backup in Tillery was suspended. And to add a little more...our all-world linebacker was hurt early on too. So basically, our O-line put our 3rd string, true freshman RB in as good of a position as OSU's O-line put 4 overall draft pick, Zeke in. IMO, O-line wasn't the issue in that game...it was a couple poorly timed turnovers by Kizer and mainly our defense not being able to stop anything. Stating the obvious but...OSU defense > ND defense. Some people just cannot be happy or satisfied. Romeo Okwara, who started college just prior to his seventeenth birthday, and was even screwed out of a red shirt his freshman year by Tuitt, et all, led the team in sacks his senior year, and has made an NFL roster, was hard to watch? No one's blaming Romeo. It's not his fault - it's the staff's job to recruit well enough to not have to start a 3-star, 12 year old. Reps for the painful truth. Ahh... The king of taking one comment and spinning it into the "truth". We had one of the best olines in the country. They played between adequate and well in every single game. Give me a ****ing break. I'm making peace with Woolly in 2017. How was it Tuitt's fault? So I'll caveat with I watched 1:45 of his Hudl. This kid has some work to do IMO. His go to move is bull rushing and over powering the OT, and doesn't seem to have quick feet/athleticism. At 6'2.5" that bull rush won't fly at the D1 level. He needs to use his feet more and develop some moves. I like the offers and love his start ratings, but I might check in and put some pressure on Echols before I took this kid if I were the staff. Unless of course his film is better elsewhere or in camps. Dwight Freeney and Robert Mathis both say hello.